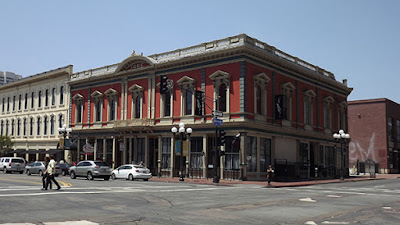 In the late nineteenth century days of San Diego, California, the Freemasons and the Independent Order of Odd Fellows joined forces to build a new combined lodge building for use by both groups. It still stands today in the city's historic Gaslight Quarter, although it is no longer in the hands of either organization. One of the Gaslamp Quarter’s most striking architectural masterpieces occupies the northeast corner of Sixth Avenue and Market Street.Built in an Italian renaissance style popular to commercial buildings in the late 1800s, the building features some fantastic architectural detailing such as Doric columns, arched windows topped with classical style pediments, and a central balcony with ornamental iron railings. The building is named after the Independent Order of Odd Fellows (IOOF), a national, religiously and politically independent fraternal order founded in 1819 by Thomas Wildey in Baltimore, Maryland. The IOOF is also known as the Triple Link Fraternity, referring to the order’s “Triple Links” symbol, alluding to its motto “Friendship, Love and Truth.”At one time, from 1862 to 1920, the IOOF was the largest of all fraternal organizations. By 1889, they had lodges in every American state and the building at Sixth and Market was built to accommodate their San Diego lodge. It was constructed at a cost of $25,000. Construction of the IOOF building began in 1873, yet the cornerstone was not laid until 1882, due to problems with material and construction quality and a shortage of capital. The laying of the cornerstone was a celebratory affair, with both the Odd Fellows and Masons holding a joint parade up Fifth Avenue to “D Street” (now Broadway), down D to Sixth, and then down Sixth back to “H Street” (now Market). A time capsule was placed in the cornerstone with various items, such as a piece of cedar wood from Lebanon, a piece of stone from Solomon’s Temple, and various newspapers, coins and Masonic IOOF documents. Both the Masons and the Odd Fellows occupied the hall, beginning with the Masons on July 29, 1882, and later, the IOOF on Aug. 5, 1882. In 1890, King Kalakaua of Hawaii attended a Masonic meeting at the hall. The legend is that the king, already a man in poor health, sat too close to an open window and caught a chill, resulting in his death in January of 1891 in San Francisco. The Masons left the hall for a new one at Fifth Avenue and Ash Street around 1910, eventually followed by the Odd Fellows. Today, the IOOF building on Sixth and Market stands as a beautiful reminder of San Diego’s Masonic history and rich architectural past. I am in awe of such a building. As of now I am in the San Diego area. I would love to see this building being restored to her rightful owner. I would urge all brothers from near and abroad to put generous contributions together so that more good men would be made better. 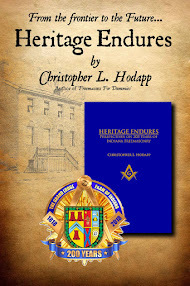 For those who no nothing about freemasonry, it is not a secret. The secret is within yourself. Every man/woman has the potential to better themselves and help make the world around them better but lack the tools. 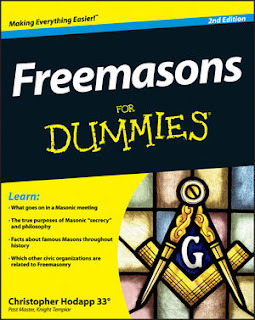 Freemasonry provides those tools. You can't brush your teeth with a mop nor clean your ears with a broom. Freemasonry is the pen and paper to draw the blueprint to real peace of mind .